Have you ever done pro bono artwork. It is an excellent way to get positive exposure. As artists we have all done artwork for friends or family as gifts. Try taking it one step further and do some artwork for your community, church or charitable organizations. The pen and ink shown above was done to aid the Shingletown Historical Society, a small community historical society that works to preserve their community legacy. They are a small organization with dedicated volunteer members. They have more enthusiasm than money. At the time, Red Tail Publishing still did book manufacturing for other independent publishers, a service that has been discontinued. 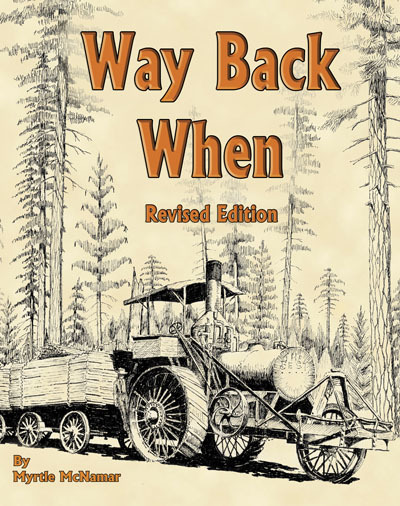 The historical society hired Red Tail to do a reprinted edition of Way Back When, a book about the local history, written by Myrtle McNamar over fifty years ago. The original cover art was lost long ago and the previous reprints of the cover were reprints of reprints. At one point the only copy of the cover art was on a tee-shirt that had been produced for a fund-raiser. The cover art had become so degraded that an acceptable copy could not be produced. Mary, of Red Tail Publishing, asked if I would like to create a new piece of cover art for the project, and I agreed. We used an old photo provided by the historical society as a basis. I flipped it around and changed the background to make it work for the cover, and you can see the results below. 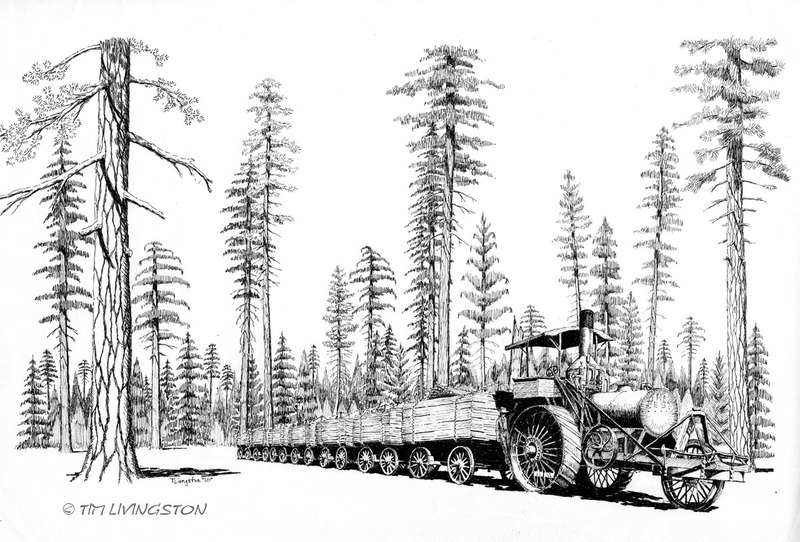 The Shingletown Historical Society, at no charge, got permission to use my illustration for their book, but I kept all rights to the art. I have done other art donations, such as illustrations for our church newsletter, and donations of artwork and commission work for local non-profits. Being an artist has not been my primary career, so I have been able to do this simply because I want to. It is a gratifying way to give back and a nice thing to support local organizations that in turn are trying to help others. It is also a great way to get your art seen by folks and to build good will. Who knows, you might even get published. Here is a link to the Shingletown Historical Society, also here. This entry was posted in Drawing, Musings, Pen and Ink and tagged art, artist, donation, drawing, illustration, pen and ink, pro bono by foresterartist. Bookmark the permalink. Wonderful work. What a privilege to do that cover. So good. Thank Don. I think there are a lot of small non-profits out there that could use that kind of help. They either don’t have the ability or the funds to do it themselves. When we as artist can use our God given skills to help them out. Besides I’d rather draw than dig hole or some other volunteer job! You wrote me a poem. Now you know why I’m an artist and not a poet. Actually, no, I don’t know why you don’t feel like a poet. I do know why you are an artist though. : ) It’s been clear since I started following you and has just gotten more clear. I love the closer more succient view of the train. A intruiguing kind of train, that I have never seen before. Thank God for historical societies and the artists who make their labor of love possible. You are way too kind. I did the top picture that size so it could wrap around the entire book. I just didn’t show the back of the book. If I was doing a pen and ink of the steam tractor I would have zoomed in on it even more. That is a long way of saying that I agree with you, I like the closer version too. Great work and wonderful attitude. Well-done!! A very generous contribution and awesome art! Thank you Scott, I’m glad you like it. You and Mary are so kind and generous to give of your talent. You are right that good things such as this sometimes reaps benefits. The picture is realy, really nice. The society can be very proud of their book with your art on the cover. Congratulations on getting a cover! A generous gift indeed. Always nice to share ones talent. Some good usually comes from being good! Really nice drawing. I have produced artwork specifically for horse rescue organizations, and also for the owner of a horse who was in need of funds to care for her (now famous) American Mustang after an accident. I’m very picky, however, about which groups or persons I donate art to. I often get requests, but many times they’re from people who know I”m an artist and think I just work for free for whoever would like to hold a silent auction. Selling my work for a fraction of its value is a great attraction to auction bargain hunters, but the net effect is to devalue the work that my collectors have paid good money for. So, I continue to custom craft pieces for special groups for which I have an affinity, but I won’t donate to just anybody. I understand that. If you donate willy nilly you will be buried with requests, especially for an established artist. Years ago when people figured out that I had a bit of talent, I was inundated with requests for free art. As a result, I didn’t do anything for free for years. I am picky also about where I offer to donate. I do think it is a great opportunity, for someone starting out, to get thier art out into public view while contributing to a good cause. However, you do have to know when to say no. Thank you Elena. From you that is a huge compliment. I bet you get ask a lot for contributions of your amazing talent. Hi Tim, I’m with you. I do quite a lot of donations. When my work goes into art auctions to raise money for charities, I set the reserve, so that even though I am doing 100% donations, I still insist that the work goes for its true value and that way the charities get a respectable amount from my art. Otherwise, if it goes for a song, the buyer is happy but the charity has come out with not much. A reserve is an excellent idea. That way you don’t feel like you did a lot of work without the charity seeing the full benefit. A reserve is the ONLY way, Tim. I’ve seen artists really burnt by their art going for pitiful amounts and all that comes out of that is that these artists will never let their works be used in charitable auctions again. I understand what you are saying. I have seen it myself. Beautiful, Tim. So much detail in this. You’re very talented and generous. Volunteering makes me feel good also , and I’m with you, I’d rather donate a written piece (or art) than dig holes. Ha! I’m learning grant writing to help with some of the charities I care about. Very fulfilling =) Thank you for the story. Grant writing is better than digging holes and I bet with your skill set you get asked to dig holes to help plant stuff. Smart woman! Grandpa always said, “Don’t be good at what you don’t like.” At least don’t tell anyone you’re good at what you don’t like. Way to go, Tim! Love the art too! Are prints for sale somewhere? No, not at this time, but I will eventually get to it. I’ve sold them at event, but not online. I live on the opposite side of the US so I can’t make it to events. When you decide to sell online or by request, please contact me. Thanks! The event will be available on youtube if you want to see it later. When I get the art up I’ll let everyone know. Tim not surprised at all, well done and great work. I believe that it is not about just take take but also give give and you clearly demonstarte it. It is even better to do it because you feel you want too, well done. Thanks Doron. It’s one of those win win scenarios. Especially, for people trying to get exposure. What a fabulous piece of art and love the contribution idea. Your drawing is a wonderful gift, a great way to preserve history and you’re right – allows folks to see your art. Beautiful piece ~ congratulations. Thank you Mary. I’ve done a number of differenet types of donations in the past, but this was one of my favorites. In this case they were able to use the art at no charge, while making the book look much more professional. However, I kept the original pen and ink, but got the piece out their on the book cover and I maintained the rights to it. This was a total win-win for all of us. Ah, I loved that drawing the moment I saw it used as your blog header. Delightful to learn you designed it as a wrap-around book cover. It’s not just great art, it’s brilliant as a design concept as well. Great work, Tim! Thank you Mark. You are much to kind, but I’ll take it! As for Sonny….isn’t that what Cher said?